GKD is working rapidly to respond to key questions in the water sector. Here’s a brief look at the company's mesh design for micro sieving in water treatment operations that contribute to a healthier and cleaner world. "We are moving in the right direction," comments Peter Wirtz, head of industrial weave at GKD – Gebr. Kufferath AG (GKD), referring to the solutions presented at the IFAT fair in Munich, May 2018. Whether microplastics or phosphorus recovery, GKD is working rapidly to respond to key questions in the water sector. Among the filter media for mechanical wastewater cleaning, discussions focused on the latest versions of the Porometric high-performance mesh. This mesh is characterized by an open, three-dimensional design with slit structure and rectangular pores. Despite boasting the same separation rate, GKD claims that its high porosity offers three times greater permeability than conventional meshes. A study undertaken at the Karlsruhe Institute of Technology (KIT) indicated that Porometric displays by far the best cleaning characteristics in comparison with all other metal and synthetic meshes tested that boast a separation rate of 25 µm, as well as the lowest backwashing rate. Many people visiting the stand requested samples, so that they can test the mesh in their own systems. GKD presented ODW6 for the micro filtration sector at the IFAT fair. This is a further development of the optimized dutch weaves (ODW) with a woven pore opening of 6 µm. Compared with the already very high particle retention of the ODW version with 20 µm separation rate, the ODW6 meshes retain more than twice as many particles. 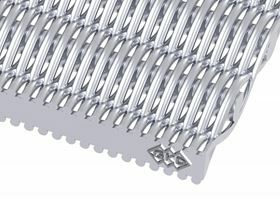 Coupled with easy cleaning by backwashing, as well as the mechanical strength and material-specific corrosion resistance of stainless steel mesh, these weaves therefore offer the best prerequisites for highly efficient processes. This characteristics profile also serves to substantiate the success of ODW6 within the scope of the research project ‘Optimized materials and processes for removing microplastics from the water system’, sponsored by the Federal Ministry of Education and Research (OEMP). It was demonstrated here that filters fitted with ODW6 in sewage plants can successfully retain microplastic particles > 6 µm while maintaining the same high flow rate. Previous filter media only permitted particle retention > 20 µm at the required flow rates. ODW6 meshes represent a significantly higher performance alternative that can replace the plastic filters currently used in all common disc filtration systems in the water industry. The stainless steel design also prevents further contamination of the water due to process-based abrasion and decomposition of the synthetic filters. This concrete approach to the focus topic at this year's IFAT, i.e. microplastics, also attracted a large number of visitors to GKD's stand. A model comparing the flow rates of common synthetic meshes, optimized dutch weaves, and Porometric mesh demonstrated the performance of the GKD mesh. "The quality of the discussions was excellent," is the summary of Peter Wirtz. "Since we have been working intensively for years on solutions to all key issues moving the sector, we have a large number of products that make a measurably better contribution than conventional media to creating a healthier and cleaner world." A GKD belt press with a wear indicator offered better performance than its predecessors . Process belt solutions for thermal treatment, dewatering and filtration will be on display in Frankfurt on 11-15 June.